Growing up if I left a door open or clothes on the floor, I might have heard the phrase from my parents “do you think you live in a barn? !” Nowadays I would probably answer that with a yes! In our previous home, we put barn wood on one of the walls of our game room and we currently have barn wood on one of the walls of our cabin second story garage space. Besides the barn wood, I absolutely love the look of sliding barn doors in the interior of a home. We are in the process of building a sliding barn door for our upper garage space to separate the living area from the storage room. It will be the typical barn door style. Since it will be located on the barnwood wall some sort of contrast will be key. I will be posting on that project in the near future. We also have a non-functional sliding door in our loft dining area in the city. This door is just an old vintage door hung on barn door hardware. The door doesn’t lead to anywhere but hopefully gives an impression of something possible behind it! Our space is so small that we can use as much interest as possible. 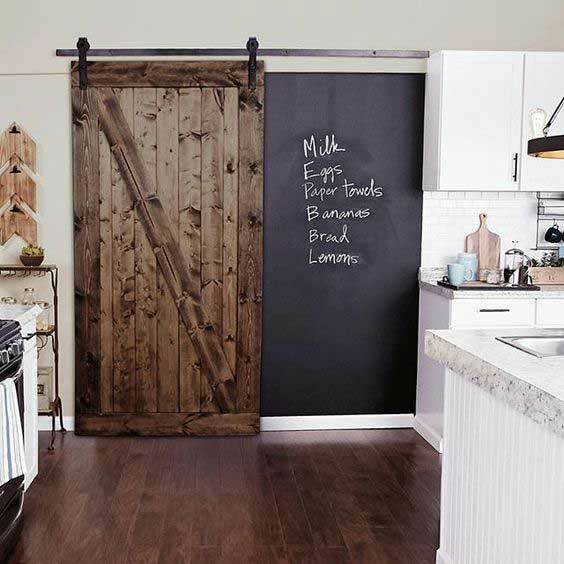 If we were to move this door to our kitchen, I might want to paint a chalkboard at the one end like this example from Lowes. It would be a fun way for keeping lists. I also really like the use of sliding doors for pantry closets. It gives a boring cabinet or closet a much more interesting look. 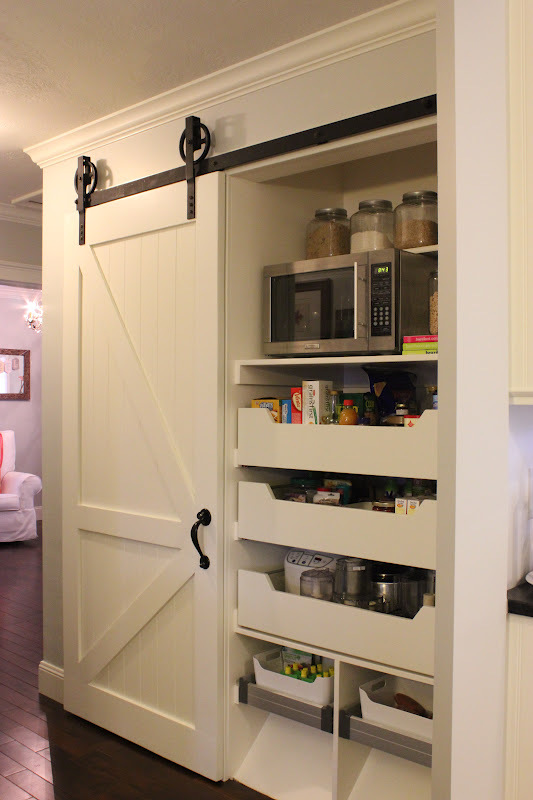 This clean and chic barn door is perfect for hiding the just as clean pantry behind. Of course, with a pantry this clean and organized you could just leave that door open all of the time! See the before and after for this project by A Tree Lined Street. 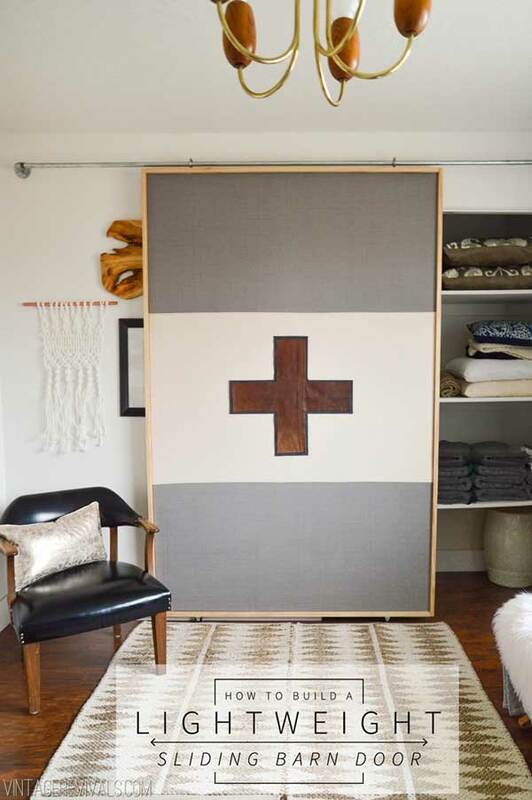 Sliding barn doors are also great for room dividers or other types of storage closets. 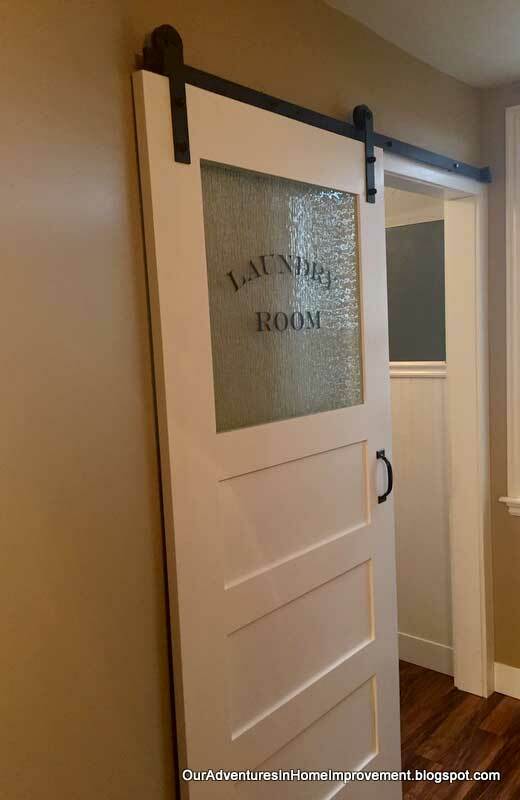 This laundry room door, by Our Adventures In Home Improvement, is another great example. I love how this custom door has the addition of frosted glass and vinyl lettering for labeling the room entry. You can see the step by step instructions to this door project over at Our Adventures In Home Improvement. For larger entrances, double barn doors are a wonderful feature. Depending on space issues, this can sometimes work better than french doors for closing off a large room. Instead of the swing space, for a set of doors, you of course need the wall space for sliding. This set of French provincial doors, seen at Attic Mag, have just the right combination of vintage charm and elegance for a more stately appearance. 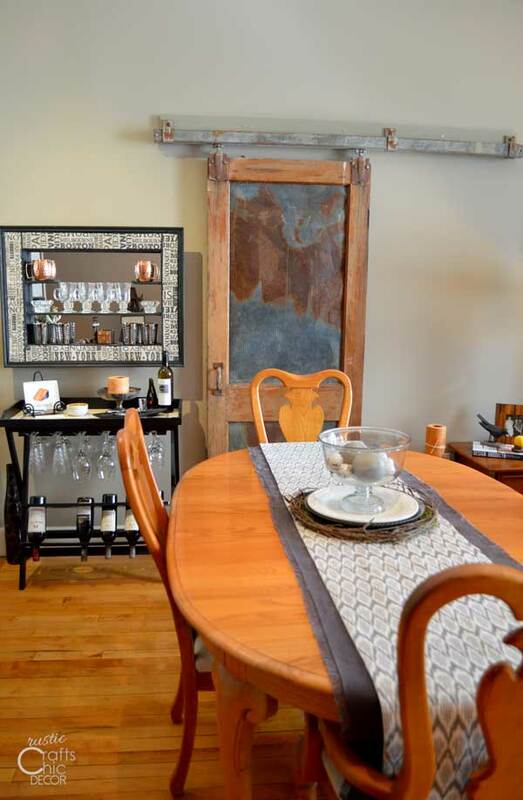 As you can see sliding “barn doors” can either be very rustic or more on the chic side. The sliding barn door hardware is really what gives the doors their name. It’s pretty easy to find the hardware for attaching a door. Many stores sell it including the major home building supply stores. Then, it’s just a matter of deciding if you want to use a vintage door or custom build your own. You can use new wood, reclaimed wood, add windows, add paint or stain, or even add corrugated metal. And, if you are worried about the weight of these doors or the expense of the hardware, I even found a lightweight option using framed fabric with DIY hardware. This unique project could be a fun option and the tutorial is easy to follow by Vintage Revivals. Can you see yourself using a sliding barn door in your own home or do you have one already? I really like these barn door ideas! I love sliding barn doors, and I’ve been thinking of adding one to my living room. I think it looks beautiful! Thank you for the ideas! Very original ideas, thank you for sharing! I love sliding doors, they are so practical and they don’t take any space. 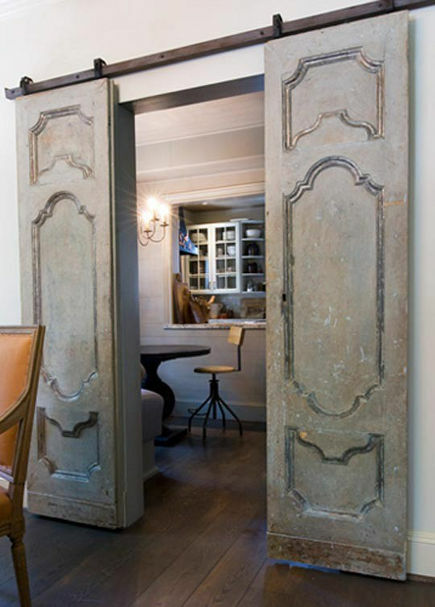 I like the closet idea, it’s a great way to repurpose old door that are no longer being used.